Deviled Eggs are a party favorite whether you are keto or not – and these Cajun Style Deviled Eggs have a little bit of heat to remind you of the Big Easy! This weekend is Father’s Day so we are having a big family cookout at a local beach to celebrate all of the Dads in our lives. Since I have been doing really well with my fitness goals using the Keto Diet, I do not want to ruin my progress with a carb heavy meal. Deviled eggs are my usual go-to with making dishes to share, but I have to be honest… I am about sick of deviled eggs. And if I had to guess, my family is as well. Since I leave for New Orleans next week I thought I would bring a little bit of my favorite city to the Father’s Day Cookout. 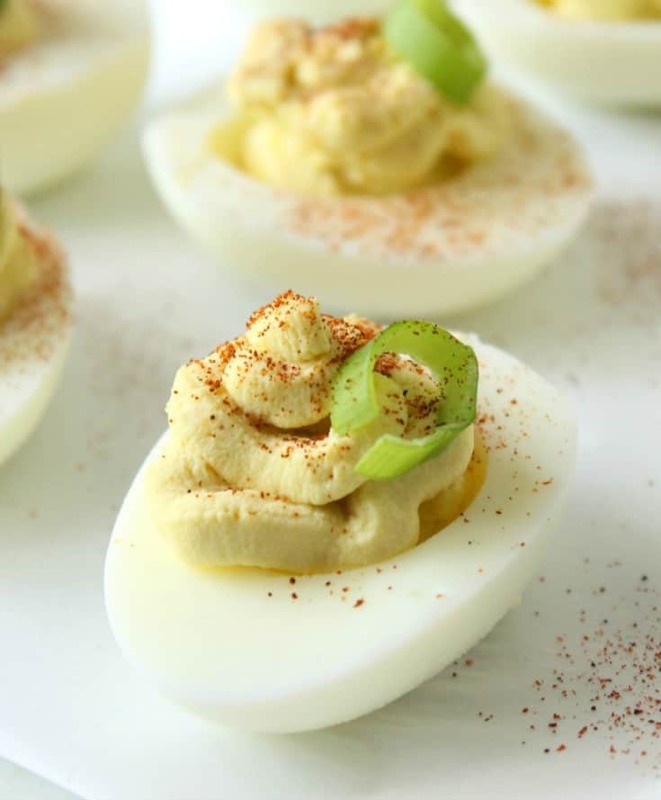 These delicious Cajun Style Deviled Eggs may look like boring old deviled eggs… but one bite and you will get the flavorful kick that NOLA is known for. Looking For More Keto Recipes? Check out my entire Library Here. The first step in having the perfect deviled eggs of any kind is to have the perfect boiled eggs. I’m sure you’ve either heard about or seen online many different tricks for the perfect hard boiled egg. Things like adding baking soda or vinegar to the water, and lots of weird peeling tricks like shaking it in a jar of water or peeling the top and bottom before blowing the egg out (not even going to get into the fact that you’re getting germs on other people food by doing this). What works for me is super easy and ALWAYS results in perfectly cooked, easy to peel eggs. Before boiling them, prick each egg with a thumbtack. Place your pricked uncooked eggs in a pot and fill to cover them. Then bring to a boil, remove the pot from heat, and cover with a lid or plate. Let the eggs sit in the hot water for 17 minutes no more no less. Drain the pot and run cold water over the eggs. Tap, and peel. The shell should slide right off! Every kitchen should also have this Elite Cuisine Maxi-Matic Egg Cooker! It cooks them perfectly too! 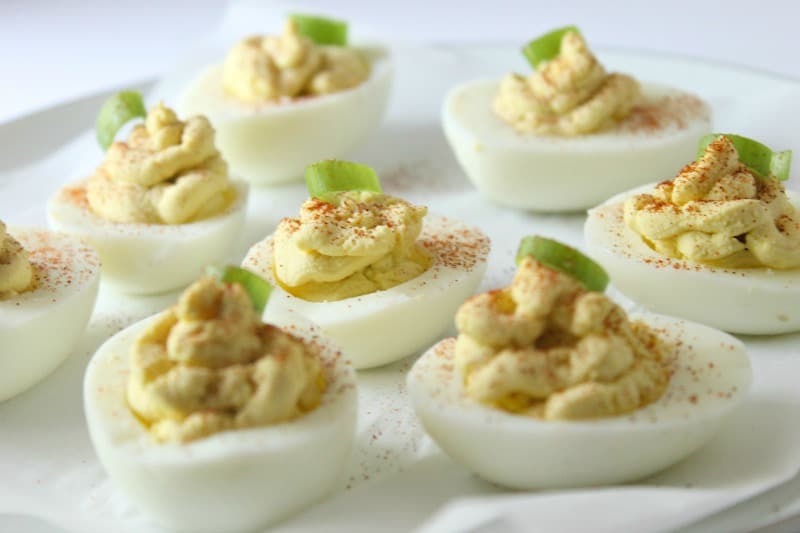 I know these Spicy Cajun Style Deviled Eggs are going to be a huge hit at our party, and it has really inspired me to be more creative with deviled eggs so that I do not get burnt out on what has always been one of my favorite foods. 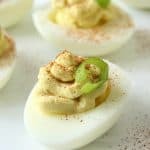 Whether you are looking for a Keto Party Snack or just looking to spice up your eggs – pun intended – these Spicy Cajun Style Deviled Eggs are absolutely perfect! I may not be able to eat them the “normal” way again! 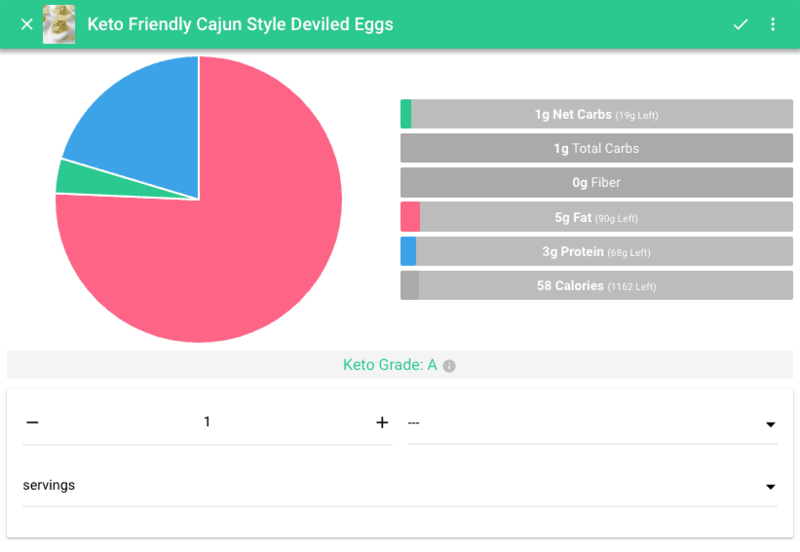 Each Cajun Style Deviled Egg has 1 net carb, 1 total carb, 0 fiber, 5 g fat, 3 g protein, and 58 calories. Note: With any Keto Recipe you want to make sure you scan and calculate your specific ingredients as exact macros many vary depending on brands! Spicy and savory – just like my favorite city! Prick each egg with a thumbtack. Place your pricked uncooked eggs in a pot and fill to cover them. Bring to a boil, remove the pot from heat, and cover with a lid or plate. Let the eggs sit in the hot water for 17 minutes. Drain the pot and run cold water over the eggs. Peel the eggs. Cut the eggs lengthwise, remove the yolks and place in a medium mixing bowl. Arrange the egg whites on a serving platter and set aside. Using a fork, mash together the egg yolks, mayo, garlic, salt, and liquid crab boil until creamy. Transfer the egg yolk mixture to a piping bag, or sealable bag with the tip cut off. Pipe the filling into the center of the egg whites. Sprinkle cayenne and paprika over the eggs to taste. Garnish with chopped green onions, black olives, or chives. Serve immediately or store in the fridge in an airtight container for up to 2 days. So we tried this recipe this past weekend for father’s day, we were already making deviled eggs so it was easy to just up our game haha! They were a big hit! Thanks so much for the share! I’ve been doing a modified Keto diet for about six months. These devilled eggs will be perfect for Christmas brunch. Thank you. These look good. I am not doing Keto, but low carb-under 40. I am running out of egg ideas!